Whoooooo's the CUTEST little owl ever??? We certainly think Eden Delaney is!!! This is my 8 month old daughter, "Edie," wearing her handmade owl costume! The idea for this costume came about because we sometimes call Edie our little bird, and I have always had a fascination with owls. After searching for a while for the PERFECT costume idea online, I finally saw an owl and knew we had to create one of our own. I told my mother, Edie's grandmother, my idea for her costume, and we created this masterpiece! Why have a plain owl when you can have a pink, turquoise, and gold one with sparkles?!?! It turned out SO much cuter than I could have ever imagined!! 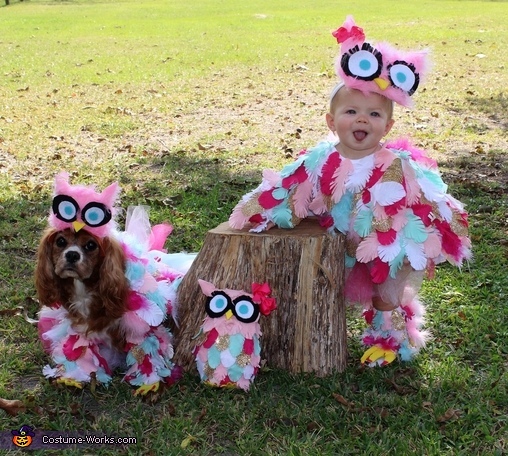 Our little owl costume consists of a onesie, legwarmers, tulle, feather boas, and LOTS of felt!! We cut out HUNDREDS of felt feathers, frayed them, and hot glued them to a white onesie. Next, we "plucked" a couple of feather boas to add more texture and hot glued them randomly on the onesie. The legs were made by the same process- hot gluing feathers on a pair of leg warmers. The wings were cut from felt and glued to the onesie after also being covered in feathers. For the talons, we cut, sewed, and stuffed felt, and added Velcro so they could be attached to socks to keep our little owl's feet warm. Of course, our owl’s talons wouldn't have been complete without her perfectly pink felt "claws." The tutu was made with strips of tulle tied onto an elastic band. Finally, we made the head by cutting the shape out of felt, sewing, and stuffing and covered it with feathers from the boa. We cut the eyes and nose from felt and added velcro on the back to attach it to a headband. the pink bow clipped to the ear was the cherry on top! Since Edie was born 8 months ago, she and our Cavalier King Charles, Lolli, have been best friends. They do everything together, so we knew they had to have matching Halloween costumes (picture included). We also made Edie a stuffed "baby" to hold. Her baby was also the perfect creation to keep her hands busy, so she didn't pull the feathers off of her costume! Edie absolutely LOVED wearing her owl costume!! She smiled and squealed every time we put it on her. I think she knew how precious she looked!! Everyone that saw her agreed that she was the cutest thing they had ever seen! She turned heads everywhere we took her, and everyone wanted to "pet" our precious little owl. No one could believe that we made this beautiful creation!